On Halloween, Upper Deck International (“UDI"), one of Upper Deck's European companies, filed a motion to dismiss Upper Deck Nevada's counterclaims against it. These claims were given to Upper Deck Nevada by another European Upper Deck company, UD BV. 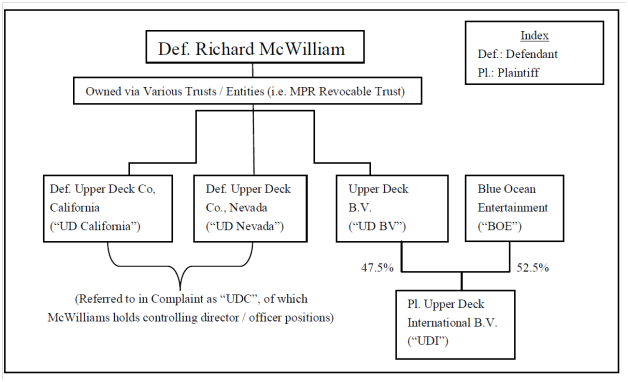 But don't forget, there were two other Upper Deck defendants (Upper Deck California and Richard McWilliam) that UDI also sued. Uh, wait, I've written about this Upper Deck lawsuit here and here, and I'm still confused. Who the heck are these guys? Well, don't worry, in its motion, UDI provided us a family tree because, as UDI recognizes, “the company nomenclature may be at times overwhelming." Considering my Jerry Springer take on the Upper Deck lawsuit, I'm shocked the family tree moves vertically rather than horizontally. Regardless, it still emphasizes just how crazy this Upper Deck vs. Upper Deck lawsuit is. UDI (the guy in the bottom right hand corner) started this lawsuit by suing UD California (the guy on the left who, I guess, would be his uncle) and Richard McWilliam (his grandpa). Then, UD BV (one of UD California's three brothers, the European brother that just happens to live next door to UDI) gave UD Nevada (apparently the more trustworthy or responsible American brother of UD California) the right to sue UD BV's own son (UDI). Apparently, UD BV doesn't want to sue UDI because UDI was nice to his pop and didn't sue him in the first Upper Deck lawsuit. Now that we understand the parties as well as we likely ever will (or want to), let's talk some legalese. In the Halloween filing, UDI wants to dismiss all of UD Nevada's counterclaims against them because they aren't “compulsory" or “permissive" (they have nothing to do with the alleged counterfeiting scheme). Remember that counterfeiting scheme involving Yu-Gi-Oh! Cards that started this whole mess? Yeah, I forgot about that too, trying to keep track of who's suing whom. Legal translation – Basically, it's UDI's position that this lawsuit should only be about the losses it incurred because of the alleged Yu-Gi-Oh! counterfeiting involving Richard McWilliam and his American UD companies. UD Nevada's counterclaims have nothing to do with that scheme, but rather with “[t]he internal affairs of a Dutch company," so, they should be dismissed. I always love this defense. It's the “don't mess up my lawsuit with your claims, go file your own lawsuit," defense. So, if UDI wins on this defense, it wins another lawsuit. And while most legalese requires some legal translation, I have to give a tip of my hat to UDI's lawyers who summed up UD Nevada's actions very succinctly, with a nice Jerry Springer twist, “UD Nevada, apparently disappointed that it had no counterclaims of its own, decided to jury-rig some claims." UDI has a few other reasons it believes the claims should be dismissed. One of the more notable is that it thinks the proper place for these claims to be heard is the Netherlands because Dutch law should apply (Crap, Dutch law? I missed that part of the bar exam). Another, reason UDI wants to dismiss the counterclaims is a pure Jerry Springer defense. UDI contends that UD Nevada forgot to bring in an indispensable party—his mom. And who would that be? Well, according to the family tree, it's Blue Ocean Entertainment. Legal translation - Seriously, UDI wants his mom. And while yelling for your mommy on the playground may not have worked, if the judge thinks Blue Ocean Entertainment is actually necessary for the case to proceed, the “I WANT MY MOMMY!" defense may work. The reason? Blue Ocean Entertainment is likely a wholly foreign company with no contacts (Legal translation ­– no money, employees. no assets, no contracts--nothing) in the U.S. Because of that, it will be very difficult, if not impossible, to haul mom into an American court. So, for the recap, the grandchild first sued his two uncles and his granddad. Then, the grandchild's dad gave one of those uncles the right to sue his son, and the uncle did just that. So finally, the son says, “Hey, you forgot, someone! HEY MAMA! THEY BE PICKIN' ON ME!" Along these lines, UDI's motion also hints that their own CEO, Mr. Blauw needs to be named too. Since Mr. Blauw is part of UDI, that would mean that UDI is schizophrenic and wants to be sued twice.